Kids who are taught to reason about the mental states of others are more likely to use deception to win a reward, according to new research published in Psychological Science, a journal of the Association for Psychological Science. The findings indicate that developing “theory of mind” (ToM) — a cognitive ability critical to many social interactions — may enable children to engage in the sophisticated thinking necessary for intentionally deceiving another person. 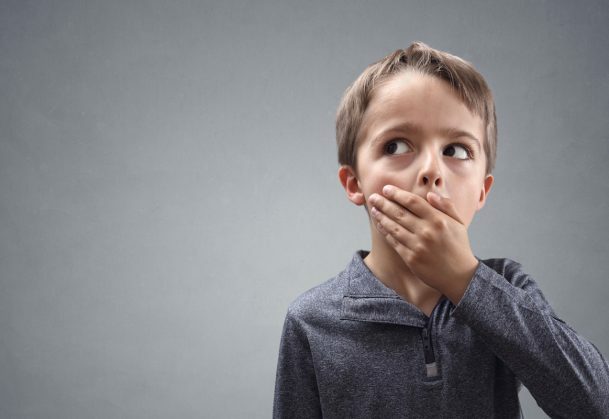 “Telling a lie successfully requires deliberately creating a false belief in the mind of the lie recipient, and ToM could provide an important cognitive tool to enable children to do so,” the researchers write. Research suggests that children begin to tell lies somewhere around ages 2 and 3, and studies have shown a correlation between children’s theory of mind and their tendency to lie. Psychological scientists Genyue Fu of Hangzhou Normal University in China, Kang Lee of the University of Toronto in Canada, and colleagues wanted to see if they could find causal evidence for a link between the two. The researchers first conducted a hide-and-seek task to identify children who hadn’t yet started lying. The children were shown a selection of stickers and were asked to pick their favorite one — they were told that they could only keep the sticker if they successfully won 10 candies from the hide-and-seek game. In the game, the child was told to hide a candy under one of two cups while the researcher’s eyes were closed. The researcher then opened his or her eyes, asked the child where the candy was hidden, and chose whichever cup the child pointed to. Thus, the child could only win the candy by lying to the experimenter about its location. A total of 42 children who never lied – who told the truth about the location of the candy on each of the 10 trials — were selected to continue with the study. The children, who were around 3 years old, were randomly assigned to complete either theory-of-mind training or control tasks focused on quantitative reasoning. The theory-of-mind training included the standard false-contents task, in which children were shown a pencil box and asked what they thought was inside. When it was revealed that the box didn’t actually contain pencils, they were asked to reason about what other people would think was in the box. The goal of the training was to teach kids that people can know and believe different things — that is, even though the child has learned the true contents of the box, someone else would probably believe that the box contained pencils. The children completed the training tasks or quantitative tasks every other day, for a total of six sessions. After the sessions were complete, the researchers again tested the children on the theory-of-mind tasks and the hide-and-seek tasks. As expected, children who received theory-of-mind training showed improvement on the theory-of-mind tasks over time, while the children in the control group did not. More importantly, the children who received the theory-of-mind training were also more likely to lie in the hide-and-seek task compared to those in the control group. And this difference held over a 30-day period. While the findings don’t shed light on the specific components of training that underlie the effect, the researchers believe their findings provide concrete evidence for a causal link between theory of mind and social behaviors like lying. In addition to Fu and Lee, co-authors on the research include Xiao Pan Ding of the University of Toronto in Canada, Henry Wellman of the University of Michigan, and Yu Wang of Zhejiang Normal University in China. This work was supported by National Natural Science Foundation of China Grants 31371041, 31470993, and 31400898; by Zhejiang Provincial Natural Science Foundation of China Grant LQ14C090001; by the Social Sciences and Humanities Research Council of Canada; and by Eunice Kennedy Shriver National Institute of Child Health and Human Development Grants HD047290 and HD022149.